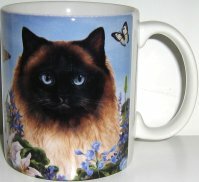 This Himalayan cat is sitting is a field of flowers and butterflies. The other side of the mug says: "Pawsitively ... Purr-fect!" This ceramic mug is 3 3/4" high and 3 1/4" wide not including the handle. Microwave safe and dishwasher safe on top rack.